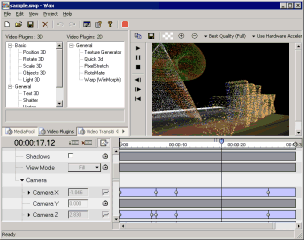 Wax can create 2D & 3D special effects and can work in two modes - as a standalone application which would appeal for home users/beginners, and as a "plug-in" to video editors/NLEs which would be more useful for professional editors. Currently Wax can work as a plug-in with Sony Vegas®, Pure Motion EditStudio and Adobe Premiere® and work for integrating with various other NLEs is in progress. Latest version is 2.0e and you can get it from this download page. The current version of WinMorph comes with Wax 1.01. If needed you can use both Wax 1.01 and 2.0 in the same PC, or just install Wax 2.0 and use WinMorph as a plugin from it. These tutorials were requested by users. If you have a request post it in the Wax UserForum. Wax can create and use 'presets' which are chain of plugins with customized parameters to create unique effects. The basic installation of Wax comes with hundreds of presets created by Vassias Loverdos and you can also create your own using Wax. Click here to get even more presets for Wax created by Vassias Loverdos. ©2012 Satish Kumar. S. Comments, suggestions, broken links? Contact me.